KUALA LUMPUR (Sept 17): Genting group’s planned US$1.1 billion (RM3.54b) Resorts World Bayshore City (RWBC) in the Philippines is set to take off under a collaboration with Alliance Global Group Inc, according to a report by the Philippine Daily Inquirer. The RWBC, which will be a new gaming hub in Pagcor City, is a project embarked on by Singapore and Hong Kong-listed Genting Hong Kong Ltd with its Philippines-based partner Alliance. The first phase of RWBC is expected to be completed by 2018, Sian was quoted as saying. Travellers International Hotel Group, a joint venture between Alliance and Genting Hong Kong, will undertake the development of RWBC. RWBC is Genting group's second gaming hub in the Philippines after Resorts World Manila (RWM) in Newport City. RWM had recently turned five. 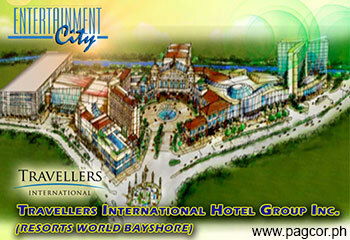 Travellers had opened RWM in August 2009 to expand Genting group’s resort and gaming operations in the Philippines. On RWBC, Sian said the first phase of the project would include three hotels with over 800 rooms besides a 3,000-seater grand opera house, and shopping mall. The project will also see residential towers and a gaming area that will be larger than Travellers’ existing facility in Newport City, across the Naia International Airport. Travellers has yet to finalise the capital spending plan for the first phase of RWBC, Sian said. “Our land there is 31 hectares. The initial phase will probably (take up) less than one-third of that. “By October, we will probably make a more detailed announcement,” Sian said. The advantage of being the last complex to open in Pagcor City, Sian said, was that RWBC would be able to offer attractions that earlier players did not have. Sian also said Travellers would not raise fresh equity to build the new complex, saying that the gaming firm was still in a net cash position. Beyond the first phase, Bayshore is envisioned to be a themed tourism estate with around 2,800 hotel rooms alongside leisure, retail, gaming and entertainment facilities. Alliance Global's website indicates that the group is one of the Philippines' largest conglomerates. The group, controlled by the Tan family, is involved in food and beverage, besides real estate development operations. Meanwhile, Genting Hong Kong undertakes a part of Malaysia-based Genting group's international casino and resort operations. Genting group, which owns the Resorts World Genting in Malaysia, has also replicated its operations in Singapore and New York. Bloomberg data showed that Malaysia-listed Genting Bhd Chairman and Chief Executive Tan Sri Lim Kok Thay owns 57.82% in Genting Hong Kong.